We were so delighted to see the return of our legendary Poker Tournament and it seems, so were many others! Held at the Compton House Social Club in Stanmore at the end of November, it was great to see so many familiar faces returning and indeed many new ones. After nothing short of a feast to start and a fabulous raffle, the tournament got under way. 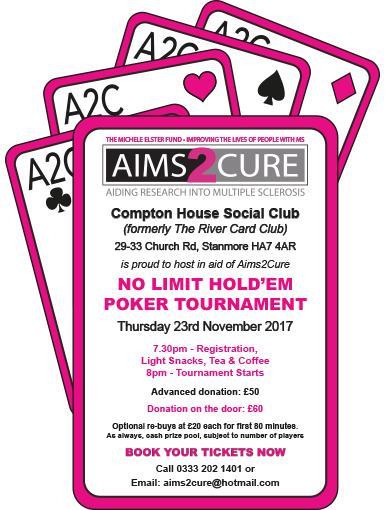 After several knock out rounds, and quite early into Friday morning, we were delighted for the winner Spencer Leslie who took the 2017 Aims2Cure Poker Tournament Crown. Thank you to everyone who came and played and donated generously and we look forward to seeing you all in 2018.